I have given baby aspirin to my dogs in a pinch before I could make it to the vet. Especially on a Sunday when it’s really not an emergency. Terra stumbled on the steps once and had a little sprain, so the medicine helped a little. But it got me thinking. Which over-the-counter pain relievers are really OK for your pets? It turns out that not all of them are alike and some can have serious side effects. Most OTC pain meds are classified as NSAID or nonsteroidal anti-inflammatories. These include aspirin, baby aspirin, ibuprofen, and naproxen. They inhibit an enzyme called cyclooxygenase which is responsible for the production of prostaglandins that promote inflammation, fever, and pain. But prostaglandins also helps maintain adequate blood flow to the kidneys, as well as the production of mucus layers protecting the inner lining of the gastrointestinal tract from stomach acid. It also aides in normal blood clotting. Thus potential side effects of taking too much or prolonged doses of NSAID include vomiting and diarrhea (often bloody), intestinal problems, loss of appetite, bleeding disorders, kidney or liver dysfunction or failure. Aspirin is primarily a pain-killer. It is also a blood-thinner which means it reduces the blood’s ability to clot. Aspirin is made from acetylsalicylic acid and when used for an extended length of time it can actually destroy cartilage and end up making joint prolems much worse. Because aspirin also thins the blood it can make existing blood clotting disorders worse, or cause internal bleeding. Regular ‘people’ aspirin formulas shouldn’t be given to a dog for more than 5 days maximum. 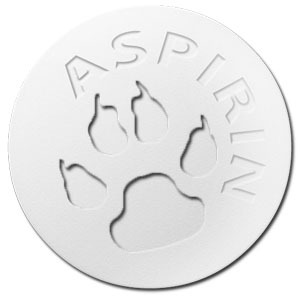 Although not all veterinarians recommend using aspirin in canines, the standard accepted dosage amounts equal from 5 mg to 10 mg per pound of the dog’s weight during a 12 hour period. (That is about 10-20 mg per kg weight). To avoid the common side-effect of stomach or digestive system irritation, choose ‘buffered’ or ‘enteric-coated’ tablets. Buffered aspirin is a better choice because it contains ingredients which help to minimize the inflammation or irritation but still allows the drug to be absorbed properly. Some brand names of buffered aspirin that are available are Ascriptin, Bufferin, Palaprin, Aftercare, Arthricare, Bayer and Drs. Foster and Smith Buffered Canine Aspirin. The medication should be stored at room temperature and away from moisture. Acetaminophen (brand name, Tylenol) is a completely different story. Acetaminophen is not an NSAID and no effect on inflammation. but when dogs ingest toxic amounts of acetaminophen, it destroys their liver cells, damages the kidneys, and converts hemoglobin, the oxygen-carrying molecule in blood, to methemoglobin resulting poor oxygen delivery throughout the body and tissue damage. In conclusion, one should really consult their vet before giving your pet any people medicine. In a pinch, a little aspirin is usually OK. However, it is better to find and understand the the source of the pain and then consulting your local physician, so you can be extra safe.